Ratha Yatra, celebrated in Purushottama Dham Puri since time immemorial, is one of the most spectacular religious festivals of the world where the One Supreme God is glorified and worshipped transcending all distinctions of caste, colour, creed, religion and nationality and proclaiming, in no uncertain terms, the lofty ideals of universal brotherhood, peace and harmony. Dr Subas Pani through his extensive study and research spread over several decades has presented in this well-illustrated book the various aspects of this great festival in a most lucid and authentic manner which will be of immense benefit to the reader. 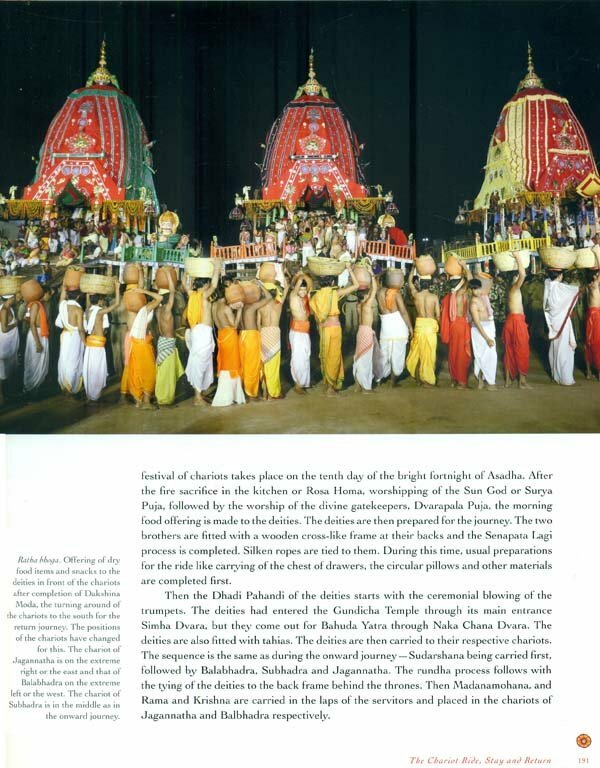 Outcome of a sustained and imaginative research, Ratha Yatra by Dr Subas Pani is a highly readable studies of this most intriguing and fascinating traditions of the subcontinent, the great chariot festival of Sri Jagannatha of Puri. The survey not only sheds light on the genesis of the deities behind the tradition but also embraces the culture including the cluster of rituals that grew around them over a millennium. A significant wok indeed. RATHA YATRA, the ancient festival of chariot journey by Jagannatha, the presiding deity of the great temple Srimandira at Puri, is one of the grandest spectacles on earth. 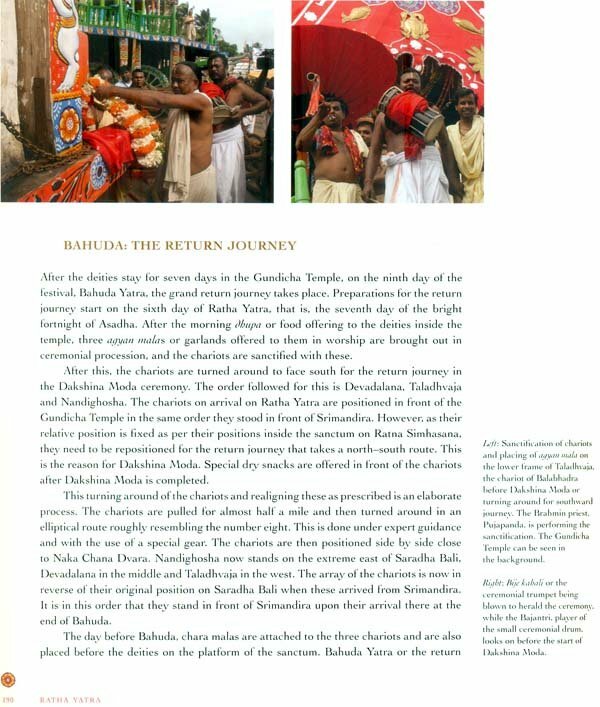 Jagannatha andhis siblings Balabhadra and Subhadra ride three colourful chariots in their annual sojourn to their garden house and birthplace, the Gundicha Temple, where they stay for seven days before returning back. Full of drama, and a panoply of rituals and ceremonies, Ratha Yatra is rooted in ancient traditions, myths and legends and embodies the most colourful elements of the classical and folk cultures of the Indian subcontinent and the Odisha region. SUBAS PANI is an author, translator, composer and creative director, with a PhD on Jayadeva's Geetagovinda. A formed civil servant, he had a lifelong deep and abiding interest in the heritage of Odisha, his research interests covering the cultura traditions of Odisha, Jagannatha and Geetagovinda. He has been a commentator for the live telecast of Ratha Yatra for the national and international channels of Doordarshan, the national television broadcaster of India, for more than two decades. His publications include Orissa: Her Monuments and Their Mies, Palm Leaf Paintings of Orissa: A Selection from the Oriss State Museum, Jagannatha Consciousness (ed. 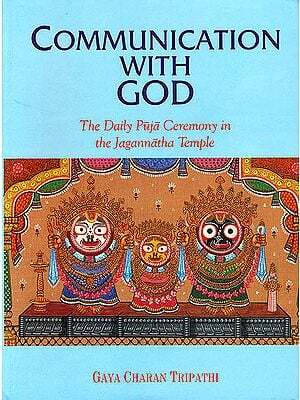 ), and Blue Hill: Hymns to Jagannatha (English verse translations from Sanskrit and Odia). His travel articles have appeared in Swagat and Nanwskar. He has also authored two seminal works in Odia on Jagannatha and Geetagovinda, conceived and curated major cultural festivals and collaborated in new choreography of dance renditions of all the songs of Geetagovinda. My tryst with Jagannatha started sometime in the early 1950s when as a child I first visited Puri with my father. I do not even remember my visit to the temple or the darshan of Jagannatha. All I remember is that we stayed in Patharpuri Hostel on the beach, a building believed to have been owned earlier by the family of Rabindranath Tagore. I really fell in love with Puri from 1974 onwards when I spent a few months there as a trainee of the Indian Administrative Service. Staying in the Circuit House, now its old block, I could get a clear view of the soaring spire of Srimandira rising above the city landscape dotted with coconut palms beyond the municipality office right across the road. I also enjoyed walking through the narrow lanes of Puri leading from the sea to the main gate of the temple, when suddenly on reaching Bada Danda, the huge temple burst open like some oversized lotus blooming right in front of you. 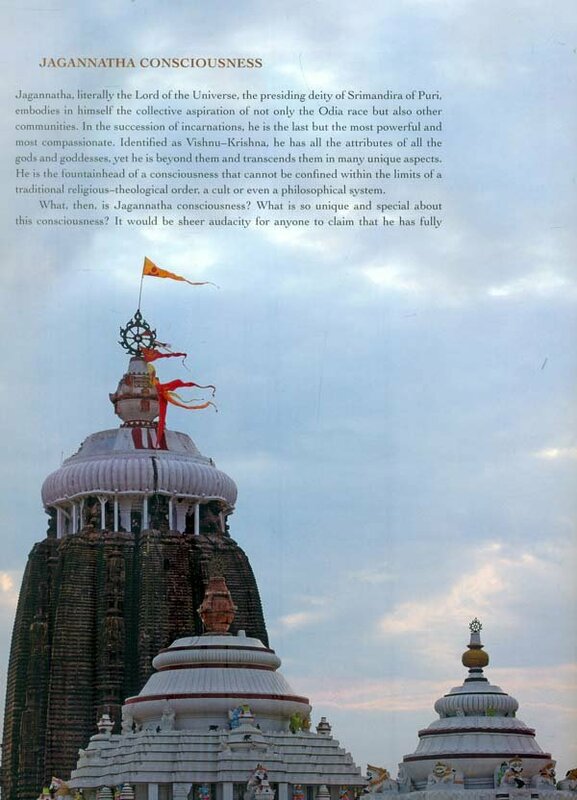 An invisible bond with Srikshetra, Puri; Srimandira, its great temple; and Sri Jagannatha, its presiding deity, slowly developed quite unknown to me. Jagannatha had cast his spell on me and in his own inimitable way conspired to strengthen this bond that was not so apparent to me when I got posted as General Manager of the newly formed District Industries Centre of Puri in 1978. Again, by a strange concatenation of events, I took up residence in the old office of the District Industries Office, and its first floor gave me an even better and more magnificent view of Srimandira than the Circuit House. I could see Paptitapabana Bana, the pennant fluttering atop Nilachakra crowning the sanctum, in all its glory across the azure skies in the background and the green foliage in the foreground. My real love affair with Puri started through its traditional crafts with which I came into intimate contact as part of my official work. I developed a personal, close and warm relationship with various traditional craftspersons. Puri is a veritable cradle of the rich and variegated craft tradition of Odisha, which it has kept alive and vibrant largely on account of its deep ties with the festivals and rituals of the temple of Jagannatha. Perhaps the only place where streets and habitations are named after different crafts, the temple town is home to Pata painters, stone carvers, appliqué workers and makers of other craft products like brass and bell metal items, painted toys and masks, wood carvings, palm-leaf etchings, sofa pith or artworks made from cork, among others. All these have a special role in the temple rituals, and the artists and craftspersons are as much part of the living heritage of Puri, the temple and the deities as are the priests and servitors more visibly involved in worshipping the deities. My bond with the artists hasevolved and remained strong over half a century, many of them becoming personal and family friends. Of them, special mention may be made of the extended family of Pdta painters who make, among other ritual paintings, the Anasara Pati that has a major role in the temple rituals in the period just preceding Ratha Yatra. Another vista of the three strands of the heritage of Puri—the kohetra, the shrine and the deity—revealed itself to me when I became familiar with and got ever more deeply involved in the understanding and appreciation of Jayadeva's twelfth-century Sanskrit classic Geetagovinda. While working in the tourism and culture departments in the state government, I became fascinated by the palm-leaf paintings and manuscripts of Geetagovinda in the state museum as well as the Geetagovinda Khandua, a tie-and-dye silk textile made at Nuapatna. The textile and the song and dance presentations of Geetagovinda are an integral part of the temple rituals and have played a seminal role in the Krishnaization of Jagannatha. 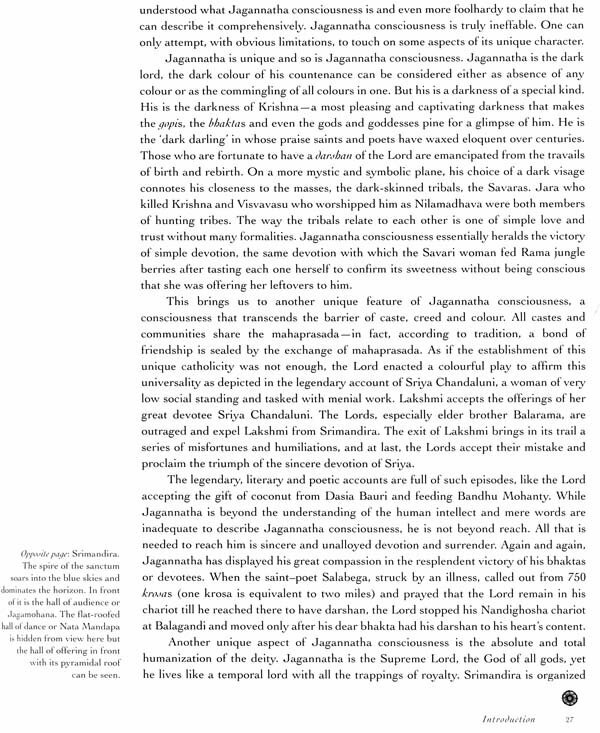 Geetagovinda and Jagannatha became the chosen realm of my research interests and eventually the subject of my PhD thesis. In the late 1980s, I facilitated the beginning of a live telecast of Ratha Yatra by Doordarshan, the national broadcaster of India. When the programme was expanded to include an English presentation in the national and international channels, I got the opportunity of giving live commentary on the proceedings of the Ratha Yatra day. I have continued to do so for more than a quarter of a century now. I have had the privilege of studying Ratha Yatra itself for a much longer period, attending both the main festival and the many preparatory festivals leading up to it every year. 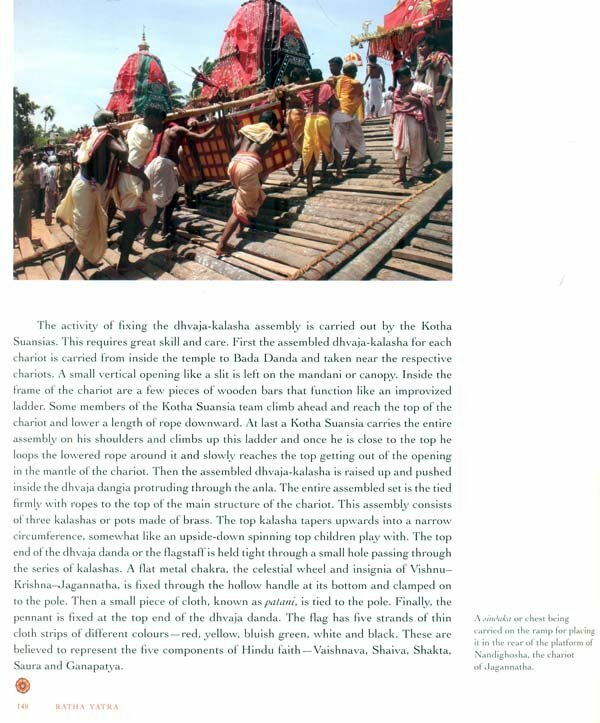 Along the way, I also had the opportunity to showcase the built and natural heritage of Puri in a special exhibition put up during the Ratha Yatra in the late 1980s. In preparing for this exhibition, I received the untiring help of late Sri Sadashiva Ratha Sharma, a scholar, traditional servitor and great enthusiast of propagating the Jagannatha faith. In spite of poor health, he took me round the ancient pilgrim centre and facilitated entry to many sites and monuments not otherwise easily accessible. This greatly enhanced my deeper understanding of the intricacies of the religious and cultural heritage of Puri that seldom comes to the notice of the public. Finally, in 2015, I got the rare privilege of studying the Naba Kalebara ceremony and ritual, which occurred after nineteen years. I was truly blessed to study the entire event first-hand, beginning with the rituals in the Puri palace, followed by Bana Yaga Yatra and culminating in the first appearance of the newly made deities during the Ratha Yatra of 2015. This exhausting but thrilling experience of studying this unique and historic event lasting over four months as well interacting with various dramatis personae of the elaborate ceremony gave me a once-in-a-lifetime opportunity and a ringside view of a great intangible heritage. I have been translating hymns to Jagannatha for manyyears. Listening to traditional musical renditions of these by great singers has given me a completely different perspective of Jagannatha. These translations were published in a collection Blue Hill in 2004. 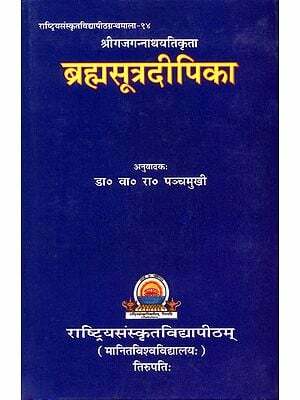 The composers of these devotional lyrics were all great devotees themselves, and the hymnswere spontaneous outpourings of their deep personal feelings and devotion. The essence of Jagannatha faith is quite simple. It involves total surrender by the devotees as well as the supremacy of their devotion. Nothing represents this more powerfully than the works of these great composers. I was especially blessed in receiving and composing music for a large collection of traditional hymns published in two sets of music CDs in Odia Sanskrit on the occasion of Naba Kalebara 2015 just as I was finishing the manuscript of this book. 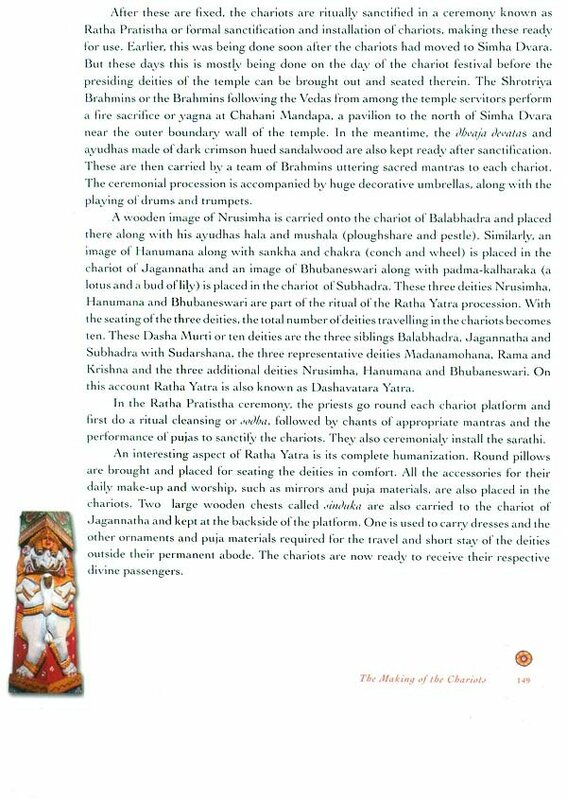 I have published several short articles on various aspects of Ratha Yatra based on my observations and research of many years. The idea of writing a comprehensive illustrated book, however, took shape about a decade back. Serious documentation for the book project started in 2006. A core team of photographers worked closely with me, documenting every aspect of this grand and elaborate festival. As so much happens simultaneously and also over a long period, it is almost impossible to do any documentation singly. We had to cover the entire duration of the festival lasting several months over many years and also across various sacred spaces. Even then, after review, it was found that photographs for some crucial aspects were still needed. So through some special efforts, these were covered during the Ratha Yatra of 2015 and 2016. A very small number of photographs have been obtained from friends and well-wishers, and a few taken by me also feature in the book. Given the nature of this book project, it required the support of many, which I received in ample measure, happily and without any reservation. It may not be possible to mention each and everyone by name here, but I would like to acknowledge with gratitude those without whose seminal contribution I could not have completed this book. In this effort, my younger brother Dr Susil Pani from Puducherry and Prof. Sanjay Acharya of the Department of History, Utkal University, did the major photographic coverage during the initial years of documentation. In the recent years, photographers Debashish Sinha from Puri and Niranjan Panda from Bhubaneswar ably continued the documentation. Tushar Mahapatra from Bhubaneswar also joined the efforts and made significant contributions. Most of the photographs form a part of the archival collection of Sri Geetagovinda Pratisthana, Puducherry, which has very kindly collaborated in and supported this book project by permitting use and access of its collection. In addition, on my request, Sri Sarat Patra of Mama Studio Puri made available a few photographs without which the illustrations for the book would have remained incomplete. I express my heartfelt and sincere gratitude to all of them. I shall ever remain indebted to them for giving shape to my dream for this book. Ratha Yatra has been celebrated over centuries, and its traditions have continued uninterrupted without much modification till today. However, with the rituals, ceremonies and practices being so elaborate and profuse, it is not possible to get a complete and comprehensive idea about it while just observing the festival as a visitor, pilgrim or a tourist. To the best of my knowledge, no exclusive book by any single author is available even in Odia much less in English dealing with the subject. I was extremely privileged to interact with several servitors and functionaries of the temple as also the craftsperson. Sri Jagannatha, Lord of the Universe, resides in his palatial temple Srimandira at Srikshetra or Puri, the ancient pilgrim town on the shores of Mahodadhi, the great ocean on the east coast of India. At the most discernible level, he is the presiding deity of a great Vaishnavite temple revered by a billion people following the Hindu faith. He is the very manifestation of the Supreme Divinity in the Kali aeon, the last of the temporal cycles before the next apocalypse. It is the fervent desire of every Hindu to have a glimpse of his enchanting appearance, at least once in his or her lifetime. As the hallowed seat of Jagannatha, Puri is considered the holiest of the holy pilgrimage destinations of India, being, in fact, one of the four such most sacred sites for the devout and the faithful. However, this is not just another Vaishnavite shrine nor is Jagannatha like any other deity worshipped in the numerous temples of India. Jagannatha, his gigantic temple and his kehetra or sacred geography surrounding the temple are unique in many respects. Besides its great sanctity and antiquity, the fact of a group of foursome presiding deities worshipped on a single platform of the sanctum along with three more deities, their being made of wood with peculiar shapes and colours quite uncharacteristic of the traditional Hindu iconography, the colourful dramatic legends surrounding their origin as well as the several layers of temples built at the same sacred site and the numerous subsidiary shrines within the temple complex set apart Sri Jagannatha and his temple Srimandira as something extraordinary. The sheer scale, number and grandeur of the many rituals and festivals of the temple and the deities have attracted millions of devotees for hundreds of years. However, these are not necessarily their most unique characteristics. Jagannatha is perhaps the most inclusive manifestation of the Hindu faith. In the syncretic character of Jagannatha faith are included the five main strands of worship in the Hindu system and much more. While it has all the trappings of highly ritualized worship conforming to the traditional Vedic rites and later forms, it is primarily based on a very simple principle of a loving relationship of the devotee and the divine built on the foundation of complete, intimate and unconditional surrender by the worshipper before the worshipped. The temple was built by powerful emperors whose remote successors still proclaim a total submission of their temporal authority before the presiding deities through a public demonstration in an annual ritual during Ratha Yatra, the greatest and the longest festival of the temple, a ritual without any parallel in the Indian subcontinent. Jagannatha is both a god and a king, but more than that he is the real lord of the hearts of his millions of devotees where he truly resides more than in his vast and regal temple-residence. He is essentially a god of the masses and his unending, deep and ever flowing love for his ordinary devotee is unmatched. This is amply evident more than anything else in his annual Ratha Yatra, the festival of chariots, during which the divine comes down to mingle with his devotees and becomes one with them. As if this annual demonstration of his intimacy with his devotees is not enough, Jagannatha also goes through the cycle of human life of birth and death in a periodic ritual and festival of renewal of his mortal body in the unique ceremony of Naba Kalebara — literally acquiring of new bodies —thus completely identifying with his human devotees. This unique ceremony lasting almost four months has no parallel with any ritual or ceremony of any deity in India or any other faith in the world. The last occurrence of this periodic festival of Naba Kalebara took place only recently in the year 2015, and the deities appeared in their new bodies for their first public audience to their devotees in the Ratha Yatra that year.